When discussing the growth of renewable energy there are two rather common mistakes. First, thinking that the capacity of a renewable power plant is directly comparable with that of a fossil fuel or nuclear power plant. Second, thinking that energy consumption and electricity consumption are the same thing. And we can even be looking at order of magnitude differences. Nuclear power plants have low running costs, so typically they run as often as possible. US average capacity factor is 90%. This is almost ten times higher than German solar. I have memories of energy “experts” informing us in the wake of Fukushima that Germany was building 7 nuclear power plants worth of solar each year. One must ask how such people can be deemed experts, and invited on to the television to provide on demand punditry. The second mistake is equally common. A rule of thumb: if a news story has a headline along the lines of “Scotland targets 100% renewable energy by 2020”, what it really means is that Scotland targets 100% renewable electricity by 2020. The difference is significant. The majority of energy consumption is not in the form of electricity. We need to drive, fly, heat our homes, produce steel, cement and do a variety of other things with oil, coal and natural gas. The central reason to switch to renewables is because of climate change, and reporting renewables penetration only in terms of electricity is to miss the whole equation. Yet people continue to do it. How much can stating renewables growth in terms of capacity, generation of electricity or energy consumption make a difference?. Quite a lot. Here I will consider global growth of wind and solar in 2011 to illustrate the point. Looking first in terms of capacity, using EIA’s data for installed capacity. 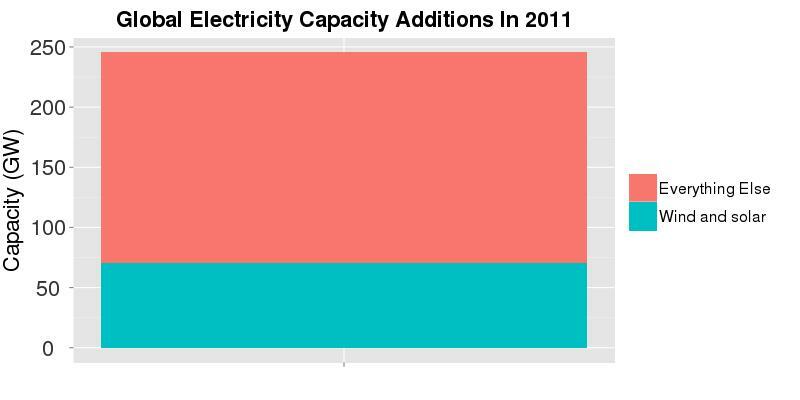 Total installed global electricity capacity increased by 245 GW in 2011, from 5085.6 to 5331 GW. Of this increase, 41.3 GW was in wind, and 29.5 GW was in solar. In other words 29% of the increase in global electricity capacity was in wind and solar. Not too bad. We can then move things things up a level, and think about electricity generation. According to BP global electricity generation increased by 646.4 terawatt hours in 2011, from 21,404.5 to 22,050.9 TWh. Electricity generation from wind farms increased by 92 TWh, and the increase from solar power was 28.3 TWh. 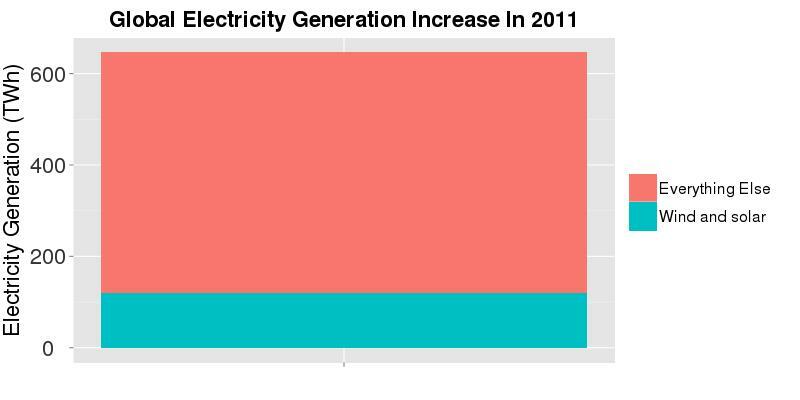 So, 19% of the increase in global electricity generation in 2011 came from wind and solar. Suddenly things are looking slightly worse. Finally, consider primary energy consumption, that is all of the energy we consume. BP state that global primary energy consumption increased by 281.6 million tonnes of oil equivalent (Mtoe) [a caveat: BP does not count biomass burned in Africa and Asia, but this is a minor detail]. Of this, 20.8 was from wind and 6.4 Mtoe was from solar. 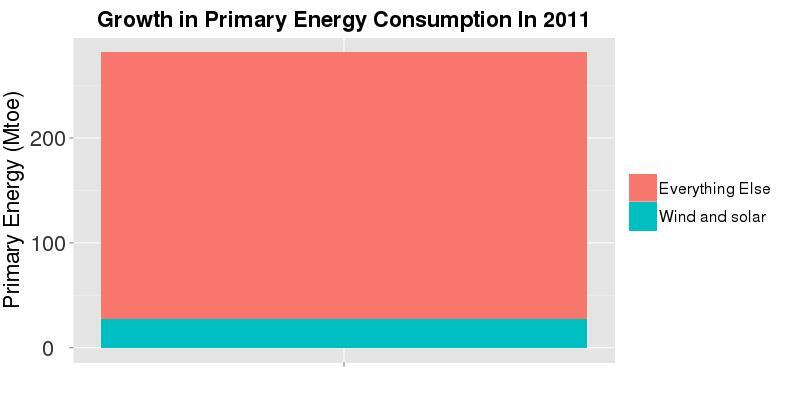 So, about 10% of the increase in primary energy consumption in 2011 was from wind and solar. And for 2012, the figure was only marginally higher. These simple comparisons show that we need to be very careful about how we state the growth of renewable energy. They also show that we are not remotely close to seeing renewables replace fossil fuels. There is still close to an order of magnitude difference between new fossil fuels being added to the global energy system and that coming from wind and solar. Naturally some nuclear advocates will point to this and show how ineffective renewables are. 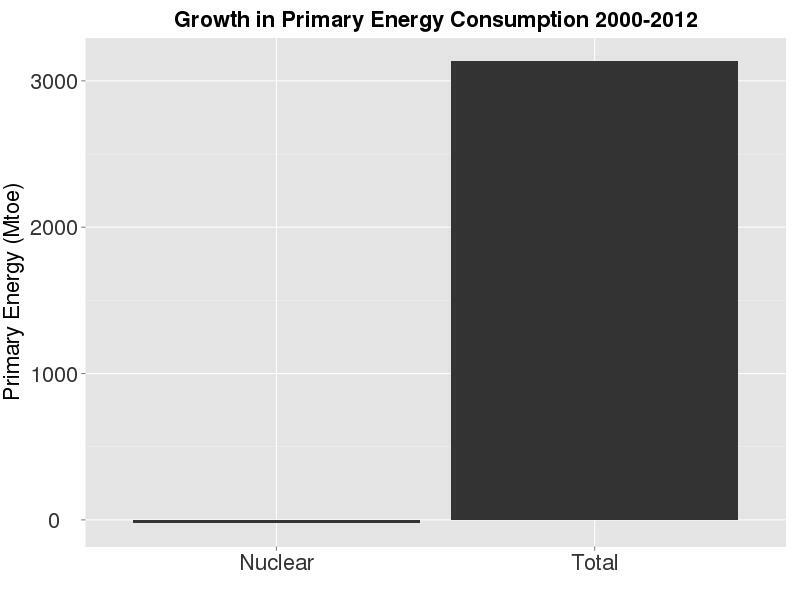 So, I will close with a graph of how much global primary energy consumption has increased since 2000, and how much nuclear energy consumption increased, or more accurately decreased. The reign of fossil fuels is not ending any time soon.